No winter is complete for Toronto’s cycling community without Cycle Toronto’s annual Coldest Day of the Year Ride. 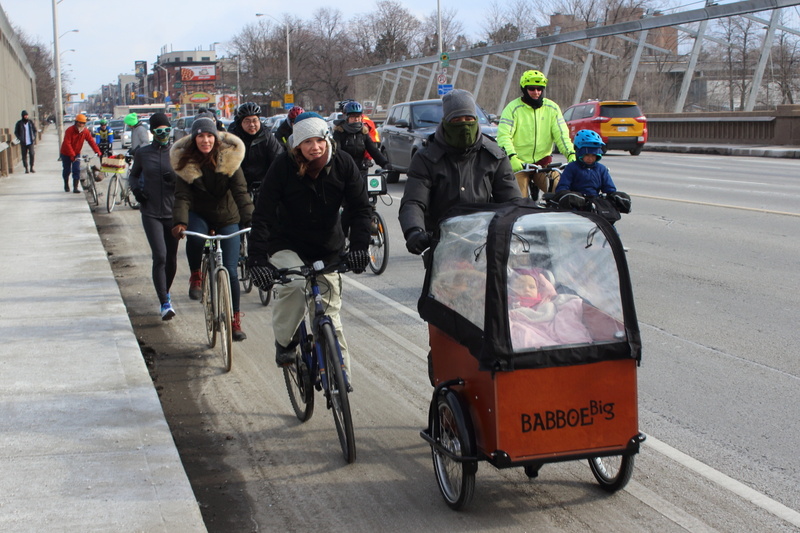 This year marks the first time the ride started east of the Don River (at Alexander the Great Parkette) to show support for bike lanes on Danforth Avenue. 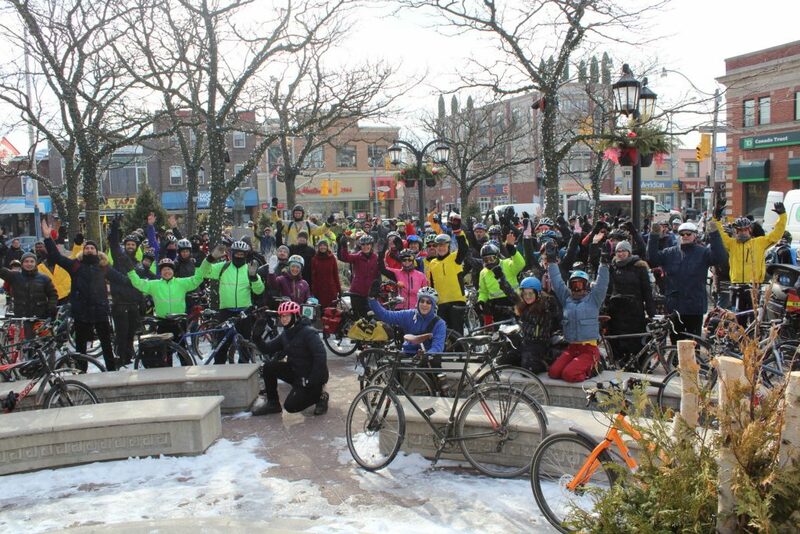 Roughly two hundred people rode their bikes in the snow and temperatures of -5 Celsius. Group start at High Park. Photo by Jun Nogami. Leading up to the ride, I took part in a small group ride from High Park which picked up a few other riders along the way. 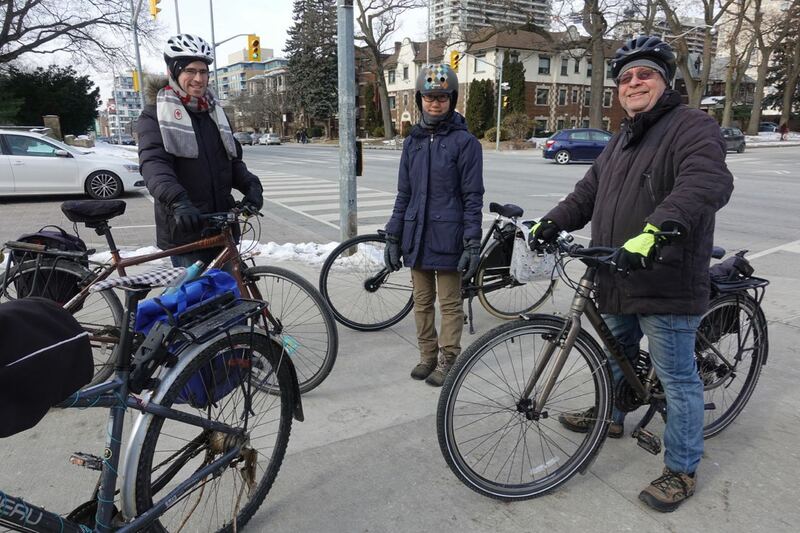 Marvin Macaraig of Scarborough Cycles also organized a ride coming from the east, while a few ambitious folks from the Durham Region Cycling Coalition arrived by GO Train. Opening remarks by Councillors McMahon and Fletcher. Some opening remarks were made by Councillors Paula Fletcher and Mary-Margaret McMahon; both of whom strongly support bike lanes on The Danforth (which the east-end councillors like to refer to as 'the Danny'). While McMahon didn’t take part in the ride, she did wear a bicycle-themed toque. Kevin Cooper, Campaigns and Engagement Manager, and Jared Kolb, Executive Director from Cycle Toronto also had a few words, while Sam Perry – who has lead numerous group rides for Cycle Toronto – highlighted the route. Map of this year's ride. 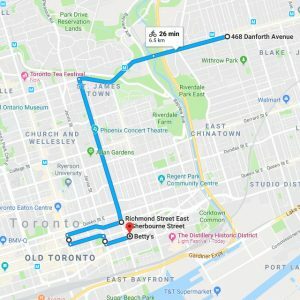 Note Google Maps used Adelaide Street instead of King Street. The ride first headed along Danforth Avenue and across the Bloor Viaduct, which unfortunately does not have bollards during the winter months. The City has been removing them each winter, apparently for snow clearing purposes even though all the other bollards around the city are not removed during winter. Fortunately, they will be back permanently starting next winter according to Councillor Fletcher. The ride then used protected bike lanes on Sherbourne where a "Watch Your Speed" sign gave "speeding" cyclists a friendly reminder. 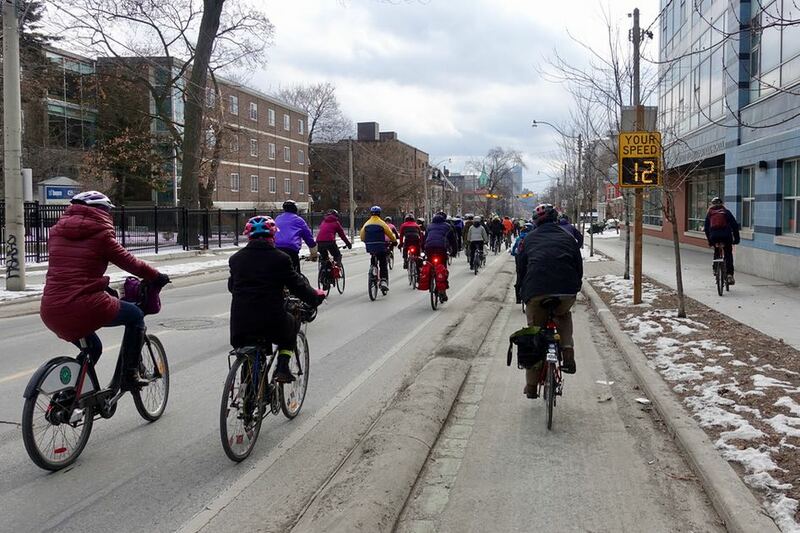 Cyclists on Sherbourne photo by Jun Nogami. 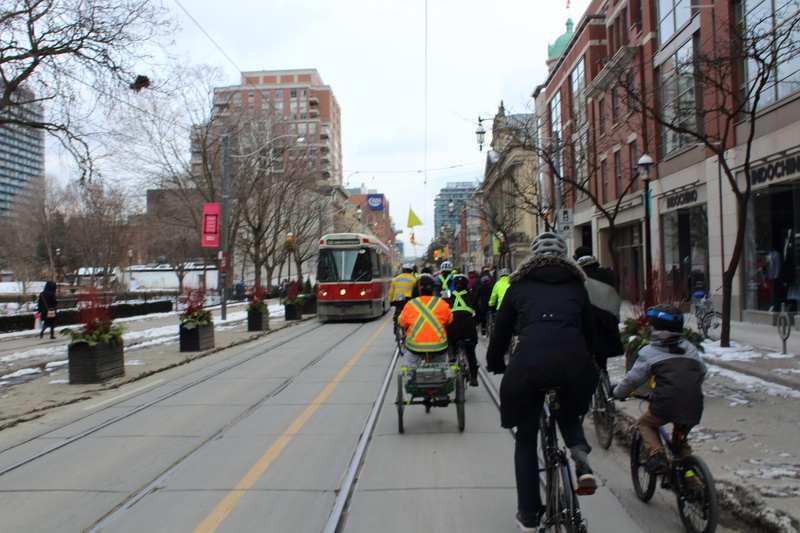 After Sherbourne, cyclists turned onto Richmond Street and made a U-turn at Yonge to the King Street Pilot. The pilot allows bicycle riders to go straight through whereas motorists are forced to turn right after one block. People of all ages and abilities could be seen along the ride. Some children and cargo bikes were there, as well as a mobile bike mechanic with Urbane Cyclist. 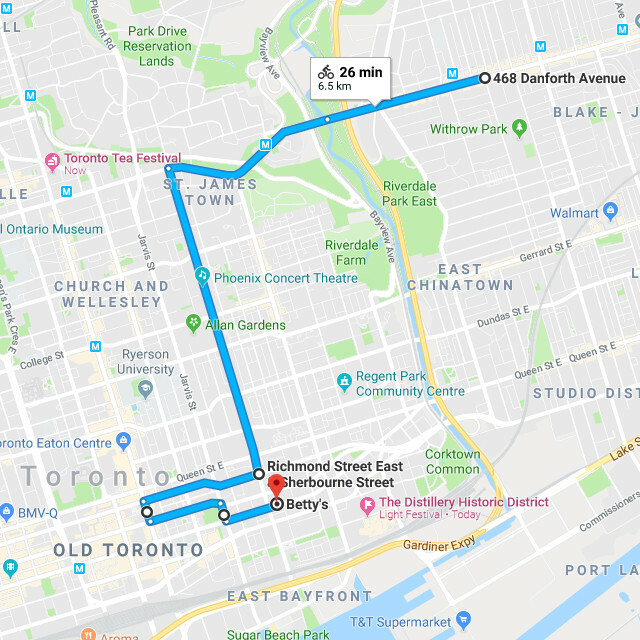 For those who didn’t have bikes – or prefer not to use them in the winter – Bike Share Toronto provided free two-hour rides. 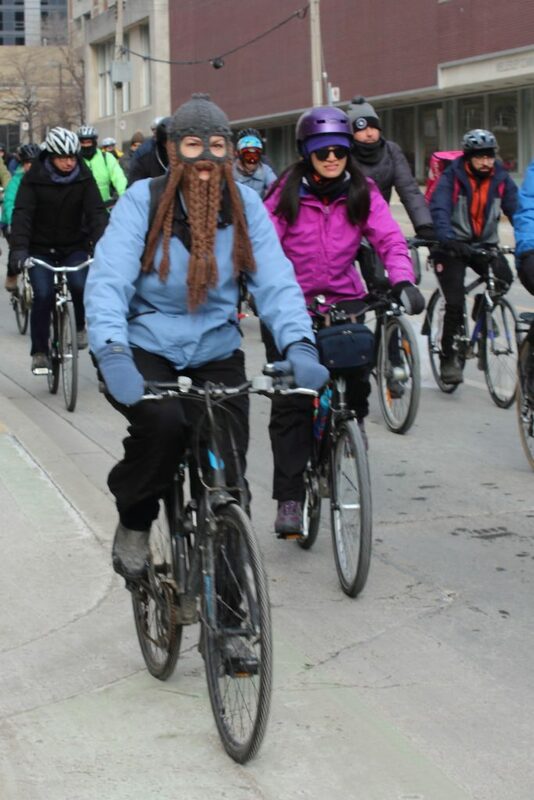 Finally, one rider gave a whole new meaning to “Viking Biking” with a knitted Viking toque. After the chilly 6.5-kilometre ride, we arrived at Betty’s on King Street for a bit of social time with food, drink, and lively conversation. 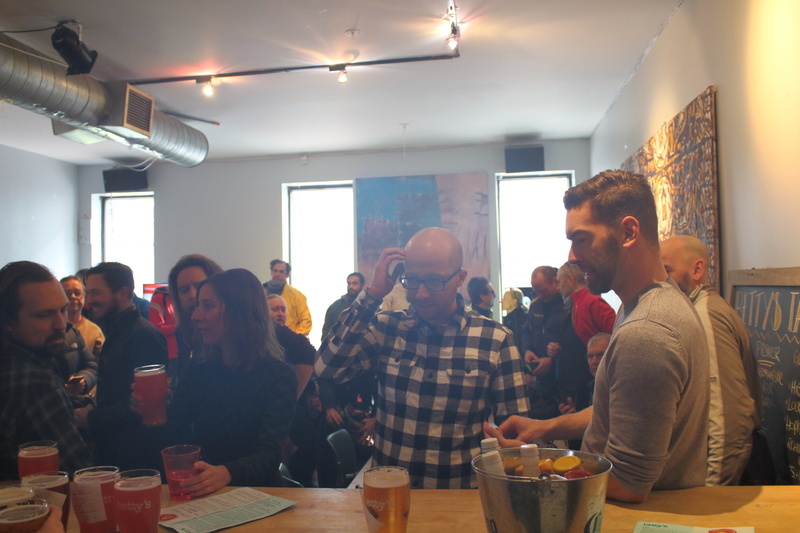 Given the limited space upstairs, those wishing to order food and drink wrote their orders on pieces of paper and used paper clips to send them down the wire to the lower level. Thanks to the Toronto Police for providing escorts along the ride, as well as to Cycle Toronto for keeping this annual tradition aimed to promote winter cycling going. 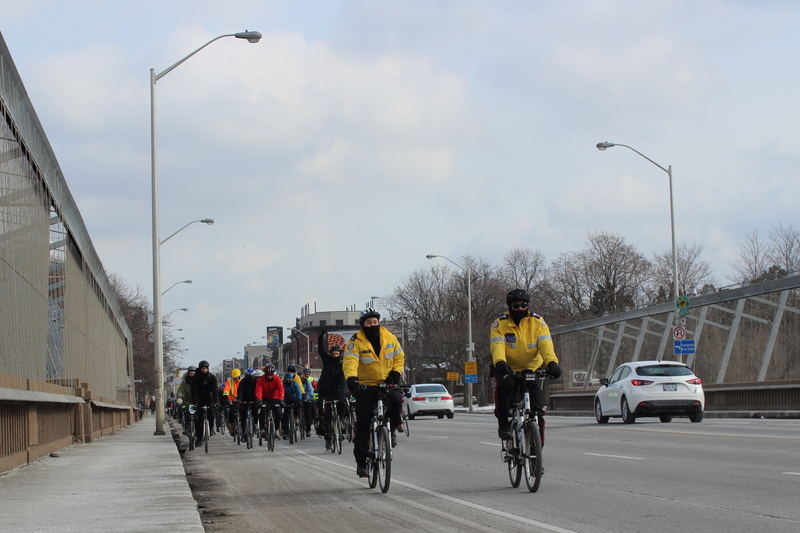 Police escorting riders across the Bloor Viaduct. You can read Jun Nogami’s take here, while you can find more pictures in this Flickr album. What bike lanes does the City have planned for 2018?